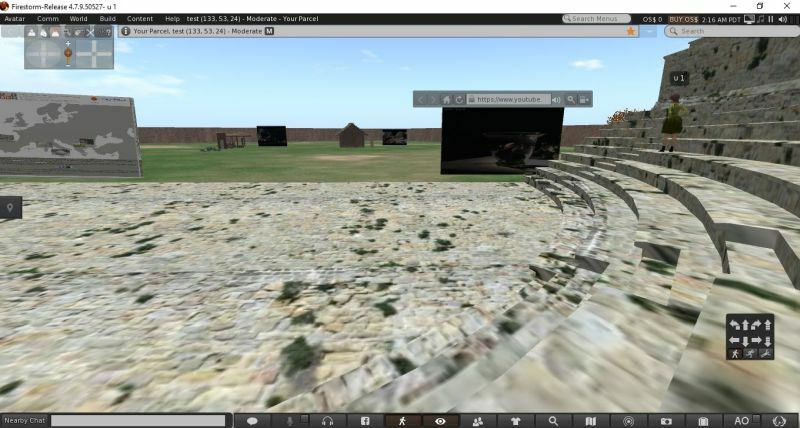 This 3D immersive learning environment allows the students and teachers from the schools participating in the Time Maps project to organize learning sessions for local history and to meet their peers within a mixed-reality medium, i.e. where virtual representations of ancient objects and dwellings are mixed with text chat, voice communications and internet access to the project’s website. The online cyber-community can be accessed by means of a viewer application, called OpenSimulator viewer. The simulator can also be used as a fully immersive environment if the participants are wearing Virtual Reality equipment (such as Oculus Rift). 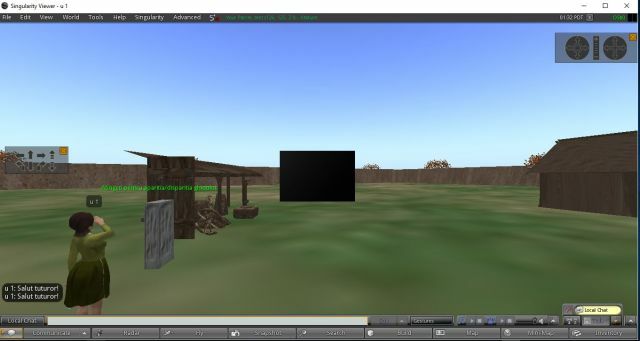 This online 3D simulator presents a Roman amphitheater where the avatars can sit and listen to an online course, watch a recorded Youtube video, explore this website; a Roman workshop (with a ceramic kiln and a glass blowing kiln); a prehistoric house that can be visited; and a series of ancient objects. The simulator was designed to be used for learning by immersion in a 3D virtual world, social meetings and cyber theater demonstrations. 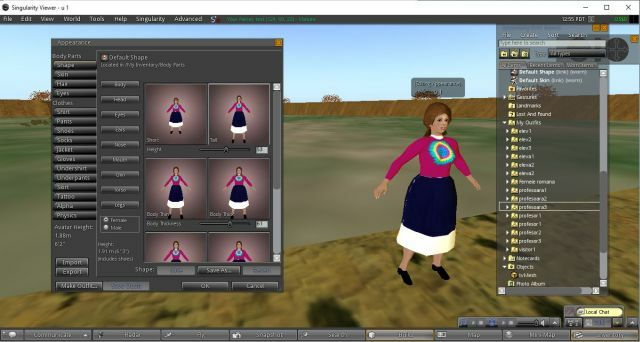 The simulator allows different users (teachers, students and their guests, to be represented by their avatars and to personalize them by their appearance (look and clothing). For the customization of their avatars (in terms of appearance and clothing), the participants can select from a collection of several outfits (image 1) created by the Time Maps team. In the images below different types of avatars are explained. A NPC (Non Player Character) was also been created as a woman dressed in an ancient Greek costume, programmed to perform as a virtual guide, which was scripted to offer a notecard when positioned in front of each learning objective. 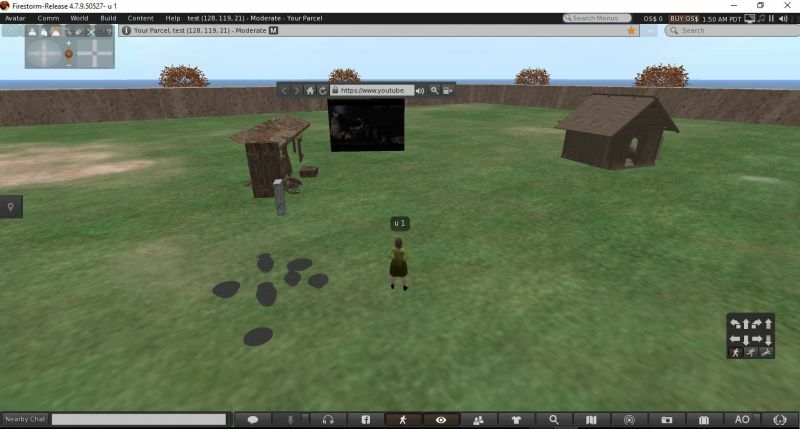 The students can explore the virtual world by walking, running, jumping or flying, can customize their avatars, can interact by means of gestures, deliver questions and read answers in the in-world text chat, and can follow the virtual guide and stop in front of each learning objective. They also can employ other gestures to express themselves. The interaction by means of voice calls is also possible and encouraged for immersive video-conferences. 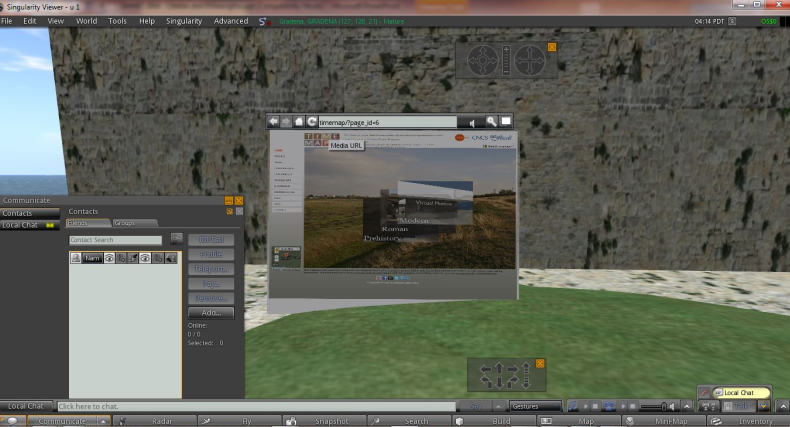 To use the TimeMaps 3D online “community of practice” within the Virtual Museum, please ensure that each working station possesses an internet connection and has installed the Singularity or Firestorm viewers for OpenSimulator. The workstation or laptop need a graphic card. In the viewer’s interface, please introduce username, password, OSGrid [Grid] and TIMEMAPS2016 [Region]. 1. 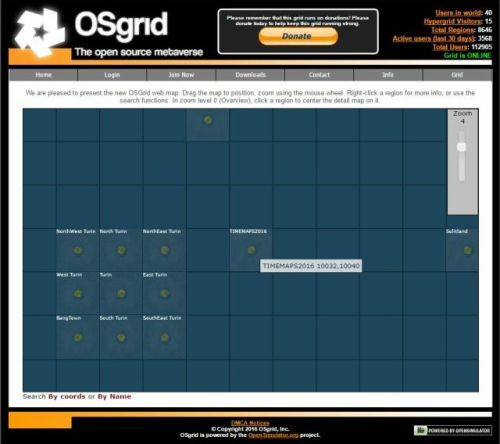 Currently, the TimeMaps 3D simulator uses grid services of OSGrid (www.osgrid.org). Please see the TIMEMAPS2016 region on the OSGrid region map. 2. Please ask for technical support to the following email addresses: timemaps.vadastra@gmail.com or livia.stefan@yahoo.com. Dupa versiunea demo din 2014 a fost realizata un nou simulator 3D online, care reprezenta muzeul virtual Vadastra. S-a utilizat platforma OpenSimulator, varianta open-source and free a SecondLife. 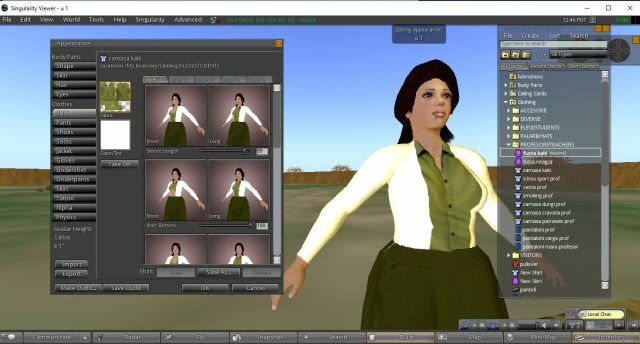 Scopul acestui mediu virtual 3D imersiv este de a facilita elevilor din scolile implicate in proiectul Time Maps invatarea la distanta a istoriei locale, prin utilizarea simultana impreuna cu profesorii lor, MA students si cadre didactice de la NUA Bucharest. De asemenea, acest mediu permite intalnirea si schimbul de experienta cu elevi si profesori din alte comunitati, de ex. Portugalia sau Italia. In cazul in care se dispune de casti de Virtual Reality (de ex. Oculus Rift), imersiunea este totala. Fiecare utilizator isi poate personaliza avatarul ca imbracaminte si aspect, prin utilizarea unor prototipuri (“Outfits”) realizate si stocate in Inventory. In imaginile de mai sus sunt exemplificati avatari profesor, elev si vizitator. Scena 3D contine un amfiteatru in care se pot aseza avatarii si audia un curs online, pot urmari un film inregistrat sau explora continutul educational de pe site-ul TimeMaps; un atelier roman continand un cuptor pentru ardere ceramica si un furnal pentru suflare sticla; o casa preistorica, care poate fi vizitata; mai multe vase ceramice romane. Utilizatorii pot explora mediul virtual prin deplasarea avatarului (mers, alergat,zburat), pot interactiona unii cu altii prin gesturi de salut, prin sesiuni de intrebari si raspunsuri scrise pe chat, precum si cu un avatar ghid virtual care le va oferi un pliant (“notecard”) explicativ in dreptul fiecarui obiectiv de vizitat. Interactiunea prin apeluri vocale este de asemenea posibila si incurajata pentru desfasurarea de video-conferinte in mediu imersiv. Pentru accesarea cyber-community online este necesara instalarea pe fiecare calculator a aplicatiei Singularity sau Firestorm pentru OpenSimulator. Statia de lucru sau laptop-ul trebuie echipate cu o placa grafica. Pentru accesul la cyber-community sunt necesare username si parola, care trebuie solicitate echipei proiectului pe adresa de email livia.stefan@yahoo.com pe baza numelui si a prenumelui, si a specificatiei elev/profesor. In interfata Singularity, introduceti username, parola, OSGrid [Grid] si TIMEMAPS2016 [Region]. Coordonatorii comunitatilor sunt rugati sa stabileasca intalniri in zile si ore de comun acord, utilizand comunicarea pe Skype (http://timemaps.net/timemap/?page_id=14). De asemenea, sa lanseze invitatii si sa promoveze intalnirile pe pagina Facebook a scolilor. Pentru suport tehnic, va rugam sa trimiteti mesaje la adresele timemaps.vadastra@gmail.com sau livia.stefan@yahoo.com. Pentru opinii, va rugam utilizati pagina Google+ a proiectului http://tinyurl.com/j9rrpeq. 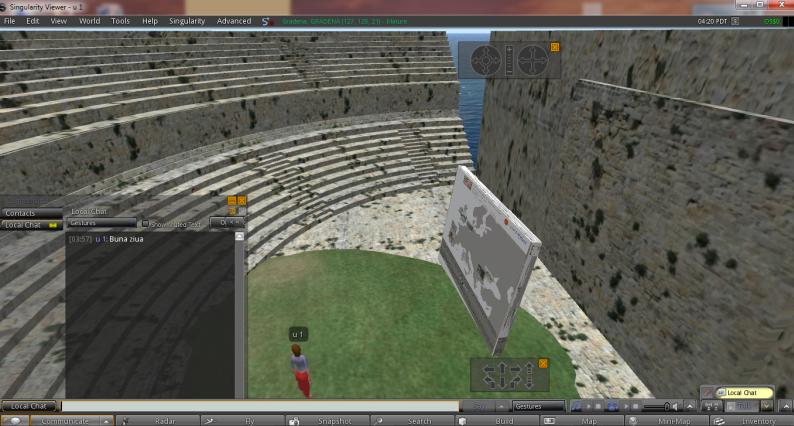 The experiment was in its early stage: the design of the 3D educational space as a Roman amphitheater where the in-world lessons and meetings will take place; the training of the children to use the environment and the in-world social affordances (chat, IM, vocal calls) and also the tools to customize their avatar’s appearance; the in-world integration of the video lessons. At this stage we intend to create a non-playable avatar with the function of welcoming the children as they are entering the learning environment.